Ryan was elected as Speaker following the retirement of John Boehner in 2012. House Speaker Paul Ryan, R-Wis., announced Wednesday that he plans to leave Congress at the end of his term in January. "It’s a big job with a lot riding on you and you feel it. You realize you hold the office for a small part of our history… and I think we have achieved a heck of a lot," Ryan said at a morning news conference. "I did not seek this job. I took it reluctantly. But I have given this job everything I have," he said. "To be clear, I am not resigning. I will serve my full term as I was elected to do." "After nearly twenty years in the House, the speaker is proud of all that has been accomplished and is ready to devote more of his time to being a husband and a father," said Brendan Buck, counselor to Speaker Ryan, in a statement. "While he did not seek the position, he told his colleagues that serving as speaker has been the professional honor of his life, and he thanked them for the trust they placed in him." 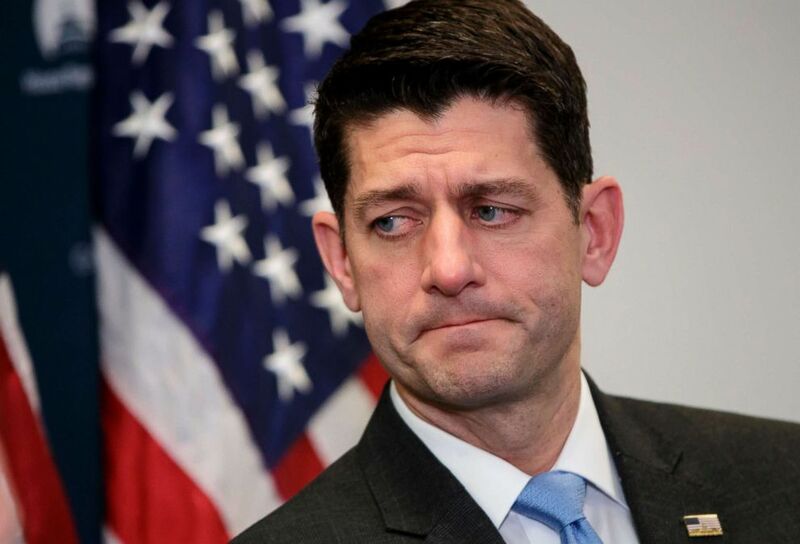 (Saul Loeb/AFP/Getty Images) Speaker of the House Paul Ryan announces his retirement during a press conference on Capitol Hill in Washington, D.C., April 11, 2018. President Trump, who has had a complicated relationship with the Speaker, tweeted that Ryan "is a truly good man" adding, "he will leave a legacy of achievement that nobody can question." Trump, Ryan and other congressional Republican leaders will have dinner together tonight at the White House, administration officials say. There were lots of long faces leaving the Speaker’s office this morning following a GOP staff meeting where Ryan reportedly told colleagues that he’s retiring in January 2019. “Not resigning,” Ryan told reporters in the hallway. A spokesman for Ryan says he’s going to “run through the finish line” and remain as Speaker for now. "I'll be handing this gavel on to the next Republican speaker of the house next year," Ryan said at his news conference. Ryan's departure is a blow for Republicans as they scramble to protect their Senate and House majorities in the midterms. His seat is now up for grabs in a district that some analysts now see as a toss-up. Ryan's move could also be seen as a sign he believes there's a good chance Democrats will take control of the House. 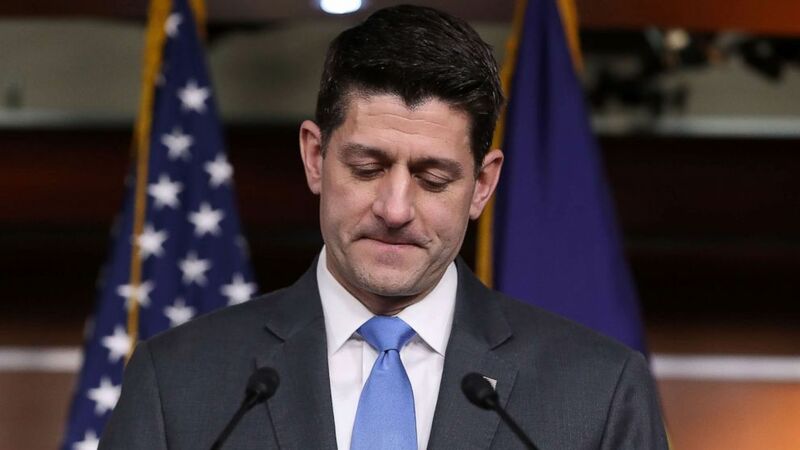 “Speaker Ryan sees what is coming in November, and is calling it quits rather than standing behind a House Republican agenda," said a spokesman for the Democratic Congressional Campaign Committee Tyler Law. Asked by ABC News whether the prospect of Republicans losing control of the House in the midterms was a factor in his decision, Ryan said, "not at all." "I'm not a guy that thinks like that," Ryan said. "My kids aren't getting any younger and if I stay they will only know me as a weekend dad and that's consciously something I cannot do and that's it right there." Asked if President Trump played any role in his decision, Speaker Ryan said he did not, and that he was happy the president gave him the opportunity to do "big things." Ryan, who was drafted to serve as speaker after Rep. John Boehner's surprise resignation, led Republicans through an overhaul of the tax code this year, a longtime goal. He has been one of the party's most prolific fundraisers. (J. Scott Applewhite/AP, FILE) House Speaker Paul Ryan of Wis., pauses as he speaks to reporters on Capitol Hill, March 20,2018. With Republicans bracing for heavy losses in the upcoming midterms, Ryan has faced lingering questions about his future and whether he would stay in Congress to lead a slimmer Republican majority or the minority. He had said he would come to a decision with his family sometime in the spring ahead of the June filing deadline in Wisconsin. Republican in the room for Ryan's announcement said he cast his decision in personal terms, explaining that he wants to spend more time with his family and noted that he was approximately his daughter’s age when his father passed away. He said at this point he really only has Sunday with his family and wants more with his kids in high school. House Majority Leader Kevin McCarthy, R-Calif., and House Majority Whip Steve Scalise, R-La., have quietly started preparing for leadership bids in the event of Ryan's departure. “The Speaker has been an avid advocate for his point of view and for the people of his district," said House Minority Leader Nancy Pelosi in a statement. “Despite our differences, I commend his steadfast commitment to our country. During his final months, Democrats are hopeful that he joins us to work constructively to advance better futures for all Americans."